​​​Surf Dog Ricochet is one of the original San Diego Surf Dogs that started the whole dog surfing circuit. As a surf dog legend, she has a wealth of knowledge on the subject of dogs surfing. So you've come to the right place for all things dog and surfing! 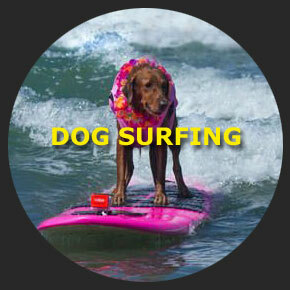 Want to learn more about surfing dogs? You’ll find that info here. Want your own surfing dog? Ricochet can teach your dog to surf. Want to enter a dog surfing competition? Find out where the next surf dog competition is being held. How about training tips? You’ll find that here too. We also have information on unleashing YOUR dog's healing power, Plus, if you scroll down, you'll find tons of information on Ricochet and Cori's programs. 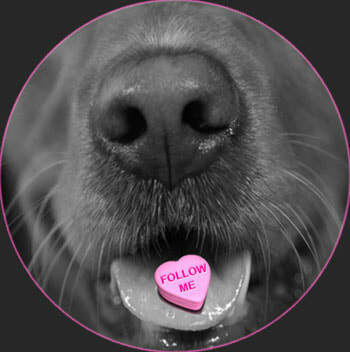 So, get on board, surf this site, and check out the action, fun and info the surFUR dogs have waiting for you! ​The first dog surf competition was in Imperial Beach, CA in 2006. It started out as a family friendly, fun way to raise funds for charity. But, the sport grew to encompass other southern CA venues and became more of a structured surfing competition. As such, Ricochet and a group of other canines were founding members of two surfing dog organizations. These days, there are competitions all over the world, and the dog surf phenomenon continues to grow. The annual surfing contests that are currently held in California are Surf City Surf Dog in Imperial Beach, and Huntington Beach, The Helen Woodward Surf Dog Surf-a-thon in Del Mar, the Purina Pro Plan Incredible Dog Challenge in Huntington Beach and the World Dog Surfing Championships in Pacifica. There are many more around the world, so please check out our surf dog competitions page. ​Ricochet isn’t just about dog surfing in San Diego. She’s a world famous, award-winning surfing dog who surfs for fun, wins dog surfing competitions & most importantly... SURFS WITH PURPOSE! She is a registered and certified goal directed therapy dog who is celebrating 10 yrs as the first-ever dog to surf with kids with special needs, people with disabilities, wounded warriors & veterans with PTSD as a form of surf therapy, assistance, healing & empowerment​. 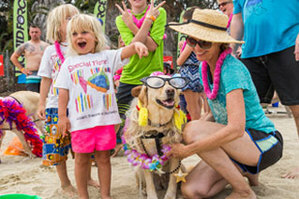 As such, she is the canine ambassador for surfers with disabilities® and surfs solo, with children, adults, pros, celebrities, other dogs, a goat & even Rob Machado! In 2009, Ricochet made an independent decision to jump on a surfboard with a boy who is quadriplegic, and started a revolution! She clearly showed the world what her life purpose is! 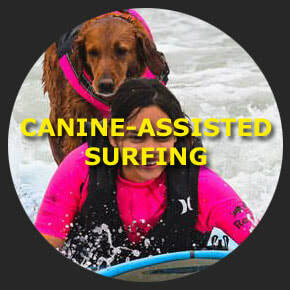 Since then, she has taught, and surfed with hundreds of individuals, leading to her role as the only SURFice dog® on the planet who provides canine assisted surfing and other activities to empower, enhance and improve the quality of life for individuals with physical, cognitive, or emotional disabilities. Ricochet has been featured in countless articles, and uses her fame to raise awareness for many different causes. She has won numerous awards including the ASPCA Dog of the Year, The American Humane Association Hero Dog Award and the AKC Award for Canine Excellence. 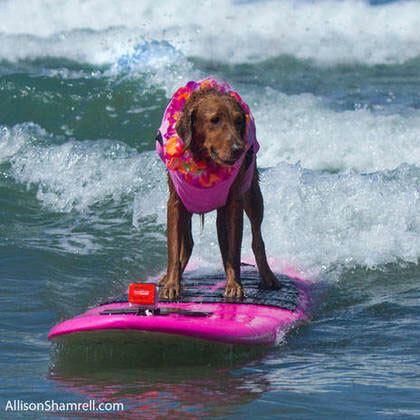 She has also been inducted into two surf dog halls of fame, and one animal hall of fame. 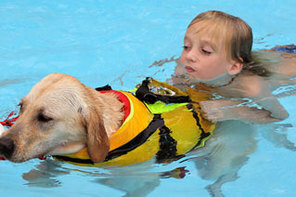 This website provides a wiki paw'dia of dogs that includes information, education and resources to all pet parents on the different types of assistance/working dogs, dog behavior, the healing power of dogs and other dog related subjects. ​We are rooted in the human-canine bond and dedicated to helping individuals grow in mind, body and spirit through the unconditional love and acceptance only a dog can provide. ​surfers since she began surfing. 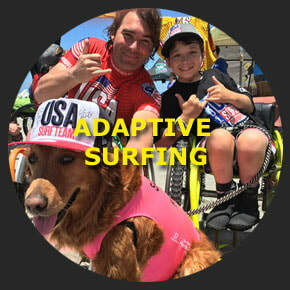 She is an Ambassador for Life Rolls On, and is a member of Team USA for the ISA Adaptive Surfing Championships. Although surfing has been at the forefront of Ricochet's work, it's her healing powers that allow her to make such deep heart-to-heart connections. 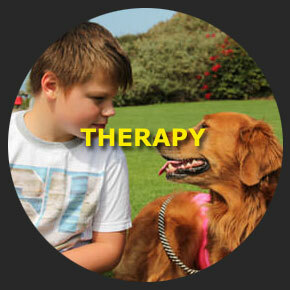 ​Both Ricochet and Cori are registered, and certified goal directed therapy dogs. In addition, Ricochet holds the highest AKC title of Therapy Dog Distinguished. 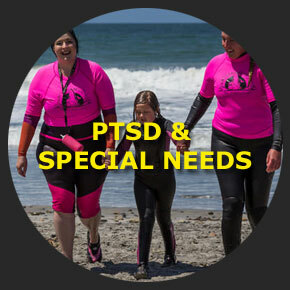 ​Ricochet works with kids with special needs and veterans with PTSD both in and out of the water, uniting them through the challenges they face. 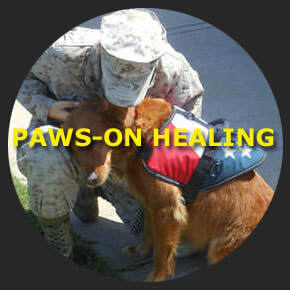 Click to unleash your dog's healing power!